I greet you and your loved ones in the Blessed name of our Lord and Savior Jesus Christ! For me, communication is at the heart of what the parish (and the Church) is about. We have good news to share: we have a faith worth imbibing — and we are being offered God’s encouraging Word to take to heart and understand. Communication is at the heart of this and must involve all available media, as it is as fundamental to what the Church is about as is the bread and wine used at the altar – (and like our Eucharistic bread and wine it should be made readily available to all who wish to partake). This is the first of a series of monthly missives designed to share relevant information, keep our parish up to date on community and local events and provide a forum through which we can expand our understanding of the liturgy and our faith. I began with the story of the descent of the Holy Spirit – Pentecost — because Pentecost marks the end of the season of Easter; it is from the beginning of our journey that our ending comes. Popular piety often refers to Pentecost as the “birthday” of the Church. The word itself is Greek and is translated as “fiftieth,” and signifies the 50th day after Easter when the Church commemorates the descent of the Holy Spirit upon the apostles. This action of the Holy Spirit is described in terms that the Bible often employs to indicate a manifestation of God. It is accompanied by fiery tongues of flame and strong winds. Those who are reported as having experienced this event spoke in a variety of languages, yet everyone could understand what was being said. On the surface it is not obvious what the meaning of this Pentecost event might be. Is there a way that we can make sense of it? We began the season with the church in flux a state of rebirth/resurrection and here we close the season by celebrating Pentecost with a church again in a state of flux. Here there is no calm, selfless, quiet atmosphere. But it is like the other description because we are back to seeing unmistakable signs of the Holy Spirit. The gathering is filled with power: fire, water, chaos, darkness, blood and smoky mist. And we witness a gathering of people hearing the Good News of the resurrection of Jesus Christ proclaimed in ways everyone can understand—each in his or her own language – a direct appeal in a language everyone can understand. This message is for everyone. It is an idealized picture of what life in the body of Christ can look like, at its very best. It is a vision of discipleship that is characterized by selflessness, grace, power, boldness, devotion, compassion, and an unyielding commitment to justice. Now the whole group of those who believed were of one heart and soul, and no one claimed private ownership of any possessions, but everything they owned was held in common. With great power the apostles gave their testimony to the resurrection of the Lord Jesus, and great grace was upon them all. There was not a needy person among them, for as many as owned lands or houses sold them and brought the proceeds of what was sold. They laid it at the apostles’ feet and it was distributed to each as any had need” (Acts 4:32-35). How do we get our church today into this state of flux? Of change? Of growth? How do we claim the power of the Holy Spirit anew? How do we capture the sense of selflessness, grace, devotion, compassion and commitment to justice, and also fuel ourselves with the amazing power experienced by the people who had come from all ends of the earth to gather in Jerusalem for the celebration of the Jewish harvest festival of Shavuot? They had no idea how they were going to be blessed by the Holy Spirit. They were totally unprepared to receive this unexpected gift that would loosen their tongues, open their hearts and minds to bear witness to the apostles’ near apocalyptic frenzy as the Holy Spirit was poured out upon them and they were transformed. Pentecost is about the moment the church was born. It is about what the church of Jesus Christ is supposed to be. It is about the Holy Spirit bringing people together as one in spite of their differences: different cultures, different languages, different traditions, different beliefs, different interpretations, even different theologies. Pentecost is about being unified in words, and in a salvation that is for all people…it is about Transformation. As we celebrate Pentecost this year we also commemorate fifty years as a parish planted to thrive in this place –a parish that in 50 years has celebrated growth and accomplishment – but has also faced darkness and chaos and, though not unscathed – has survived to mark a milestone. At 51 will we be celebrating renewal and growth or will we be unable as a body to find a way to reconcile: forgive the debts of those with whom we disagree, restore our lands to their rightful owners, and find a way forward together? 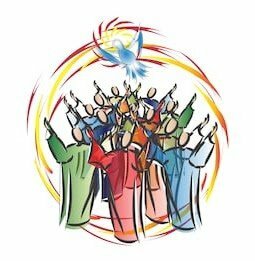 Pentecost invites us to consider our own participation in the fellowship, worship, and mission of the church. It is a time to renew our commitment, to live as an essential member of the body of Christ, using our gifts to build the church and share the love and justice of Christ with the world. As we commemorate our parish’s birth and work towards it’s renewal, we give thanks for those who have labored to build this Church and we ask that the abundance of the Holy Spirit be poured out upon this parish as we use the gifts of the Spirit continue to do the work of building God’s kingdom here at St. Edward’s and in the world. Pentecost presents us with an opportunity to consider how we are living each day. Are we relying on the power of God’s Spirit? Are we an open channel for the Spirit’s gifts? Are we attentive to the guidance of the Holy Spirit? Is the fruit of the Spirit (love, joy, peace, etc.) growing in our lives, in our Church? The community of God’s people is central to God’s work in the world. Can we start the next 50 years as the apostles did growing our church and welcoming all? Let us continue to celebrate this church’s beginning as we go forth rejoicing with great hope, proclaiming salvation for all people! Praise be to God the Father, God the Son, and God the Holy Spirit! This entry was posted in Rector. Bookmark the permalink.